CPQ systems continue to be a hot topic for any company that’s using Salesforce. It doesn’t take the office Einstein to find out why. They do a pretty bang up job of maxing out your sales funnel with fast, efficient and accurate sales documentation preparation. The results that customers have experienced with CPQ implementations present a compelling case (hello, up to 105% increase in average deal size! ), but is a CPQ overhaul something you should consider? If so, what CPQ system will be the right fit for your company? 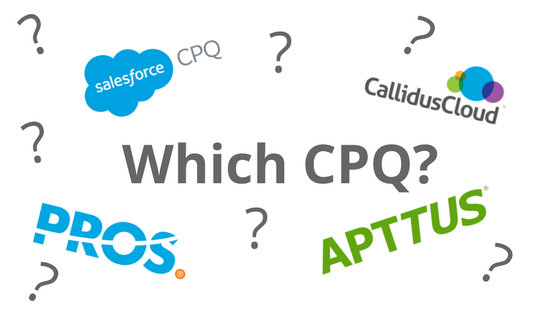 Do I need a CPQ system? Do you have a flurry of spreadsheets to keep track of your pricing structures? Are your reps wasting time or sacrificing accuracy with your current system? Have you suffered from slip-ups and mistakes in your quoting system in the past? Are you feeling frustrated that your sales documentation system (or lack thereof) isn’t more intuitive or automated? If any of those questions resonate with you, a solid CPQ system could save you from quite a few future stress headaches. How do I evaluate CPQ systems? Maturity and strength of the software: Has the company been doing this sort of thing for a while? Is it well respected in the community? Integration capability: Is the software native to Salesforce? Does it integrate well with your current systems? Support system: If you have questions or problems, will it be easy to learn how to fix them? Is the knowledge base there if you need to improve your system? Customizability: Is it easy to customize the product if you have the need? User-friendliness: Is it easy for your reps to learn and use? What CPQ systems fit my needs? We’ve selected a few of our favorite CPQ systems that we think are worth considering. There’s no “one size fits all” option, but there are quite a few CPQ systems that could be a great fit for you. Salesforce CPQ is (obviously) completely native to Salesforce and offers excellent speed and fantastic flexibility. It can handle large deals with ease and offers the ability to add on to existing contracts, upsell for the following year, offer multiple discount thresholds, and a lot more. Plus, it doesn’t take long to implement—you could even DIY it if you want to. Apttus is also native to Salesforce and offers a full suite of CPQ-CLM-Billing tools. If you’re feeling flaky about ditching your Excel spreadsheets, Apttus offers plug-ins. Apttus is also great about listening to their customers to drive innovation for the platform. CallidusCloud CPQ is a bit of a data wizard. It converts past sales analytics into future decision-making data, including commission management and maximizer tools to really light the fire for your reps.
PROS Smart CPQ is an ideal choice for those looking to empower their sales reps with an irresistible user interface that does some serious pricing heavy lifting. PROS also offers a site for end customers—perfect for companies that allow customers to have customization options, like PC configuration or health care choices. Feeling a little overwhelmed or itching to get started with CPQ as soon as possible? We can help! Having a true expert (that’s us!) in your corner can make a huge difference when you’re attempting a smooth CPQ add-on implementation that hits the ground running. Reach out today to start the conversation. Note: This post was originally published in November 2014 and has been completely revamped and updated with the most accurate information as of March 2017.